We will use DX-pedition mode for all bands except 160m. Configure the software and radio per the WSJT-X and your radio’s installation instructions. Do not use VP6D as your first FT8 on the air experience. Your WSJT-X software must be configured as a Hound. You must configure your WSJT-X frequency table to match our planned FT8 frequencies. 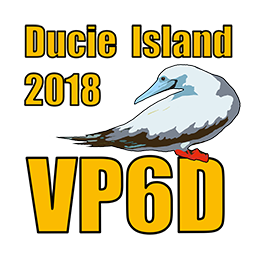 shown at: https://www.vp6d.com/index.php/dxpedition/frequencies or as announced via Social Media. VP6D will be transmitting BELOW 1,000 Hertz. You MUST select an open calling frequency between 1,000 – 4000 Hertz. Once VP6D replies to a Hound with RR73 the QSO is completed and logged. The Hound does not need to send 73 to complete the QSO. Note 2 If you don’t complete a QSO within five minutes after being called by VP6D that you should restart a new QSO .